As new treatment protocols and new time-critical interventions are introduced in emergency medicine, the burden on the ambulance system might increase. Insight into operational trends is needed to optimize resource allocation in this service. Our aim was to examine the frequency of ambulance missions in Sør-Trøndelag County the last decade. Secondly, we wanted to assess trends in classification of urgency, age among patients and gender distribution. We did a population-based data registry analysis. From the ambulance database for the county of Sør-Trøndelag data from the years 1997–2007 was retrieved. Missions were stratified by year and classification of urgency (ordinary, urgent and acute). Further, we calculated gender distribution and age averages for each year. 257 089 ambulance missions were identified. Number of missions increased from 19 233 in 1997 to 27 306 in 2007. Population-adjusted numbers revealed the same trend. 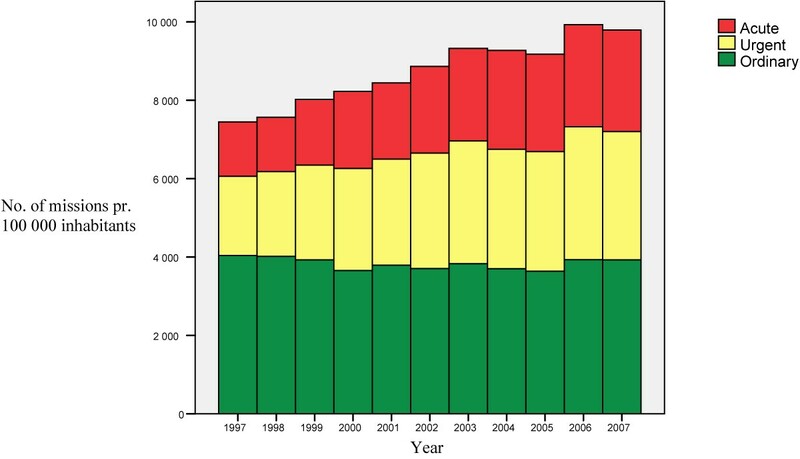 While number of missions classified as ordinary was almost constant, the increase in total number of missions was attributed to an increase in urgent and acute missions. We have documented a large increase of ambulance missions in our county during the last decade. The increase consists of missions classified urgent or acute. As these missions require an immediate dispatch, this increased workload on the ambulance system might compromise patient safety due to lack of available resources. The current study could not assess the reason for this trend. Dispatch criteria, initial medical problem among patients and system factors should be further studied.